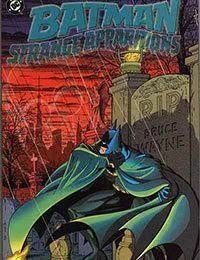 BATMAN: STRANGE APPARITIONS collects the late 70s stories that were monumental in elevating Batman from super hero to cultural icon. Considered the definitive Batman tales, this book transforms the Caped Crusader into a three-dimensional character who is as much adventurer as detective. Featuring bold and rich portrayals of the Joker, Clayface, Hugo Strange and the Penguin, this book also includes Bruce Waynes love affair with Silver St. Cloud and her astonishing discovery of his alter ego. These stories and character interpretations are the foundation upon which Batmans current mythos was built.